Kids’ birthday parties give parents an opportunity to use their creative side. There are endless possibilities for themes, decorations and food that can make your fete grand. By choosing an age-appropriate theme and kid-friendly menu, you can have a celebration your little one will remember for years to come. 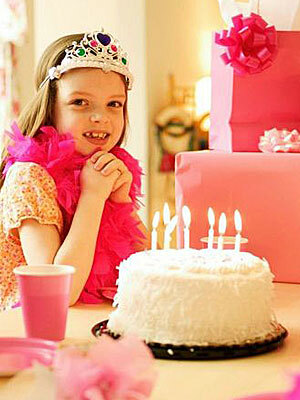 It is easy to fall into the trap of planning your kid’s party around the time of year or season. However, just because it is November, does not necessarily mean you should throw a autumn-themed soiree. Consider the child’s interests, hobbies, favorite movies or characters when selecting a theme for the party. Keep in mind that kids enjoy things that are personal to them. Be sure to involve them in party preparations. After all, it is their big day. If you need help with decorations, go to the local party or craft supply store for inspiration. You can even order party supplies online. To make your own decorative pieces, print pictures pertaining to your theme. Place said images back-to-back with a string in between for an easy and inexpensive mobile. Another festive homemade creation is a banner. Purchase colorful stationary or even themed paper that you could print single, large letters on each page to read “Happy Birthday.” Clip each page to a string, rope or streamer with clothespins for some cute décor. While you can get creative with other aspects of the fete, food should remain on the simple side. Most kids like simple eats, like finger foods. Consider edible options that are easy to grab on the go since guests are running around. Chicken fingers, pigs-in-a-blanket and mac and cheese are all delicious easy-to-make choices. To be on the safe side, stay away from peanut butter for those with nut allergies. While food can be kept simple, dessert may be more of a culinary adventure. A great option is to have a make-your-own sundae station with a variety of ice cream or frozen yogurt flavors. Fill bowls with your popular toppings, such as candies, sprinkles and marshmallows. Another choice is to serve cupcakes, either homemade or from a bakery. Again, young guests love treats they can grab. The best part about throwing your kid’s birthday party is that there is so much you can design yourself. Remember, have fun and create a day that your little one will never forget. A party planner right in your device, the application prepares everything, from guest lists and receiving RSVPs, to shopping lists. Choose from more than 60 designs to create party invitations. An added bonus is that invites can be sent directly from your phone though text message or e-mail. Organize your dining situation with this virtual seating chart. Import friends and use its drag-and-drop function to set guests’ positions. Ricky Eisen is the founder and president of Between the Bread, one of Manhattan’s most renowned and prestigious corporate catering companies. With more than 35 years of experience in the food and beverage industry, Eisen oversees all Between the Bread events. Through her career, Eisen has made several television appearances, including The Apprentice, Good Morning America and local morning shows. She continues to provide catering for charities and has served on the board of the Israel Cancer Research Foundation of New York. Eisen studied political science at Hunter College in New York City.